The range of ATA security features are well defined, however, you will be hard pressed to find an operating system with a tightly-integrated tool chain that consistently leverages the benefits of ATA. The hdparm tool, which is included with almost all Linux distributions, at least lets you control the ATA security features by scripting or manual commands. 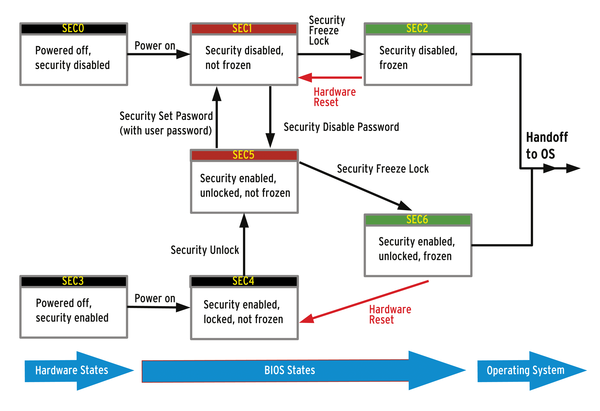 On many laptops, ATA security is integrated into the BIOS. This article describes how you can control access to your disk data through ATA security. When you buy an HDD or SSD today, all the security features are initially disabled. A query with hdparm as the root user provides ATA security information (Listing 1). The device is now in SEC2 state. The associated hdparm -I output is shown in Listing 2. The counterpart to freezing (thawing, so to speak) does not exist. It takes a hardware reset or power cycle to revert to the SEC1 state (Figure 1). Figure 1: The possible security state transitions in the ATA Security concept. I do need to point out a possible pitfall: the BIOSes of many notebooks run the SECURITY_FREEZE_LOCK ATA command when booting to provide protection against manipulation. In this case, it would be impossible to carry out any further changes to the security state on the current system. In fact, I already had to cheat a little at this point. My laptop freezes the built-in SSD via the BIOS at boot time. Your only option is to install the disk to a PC with a BIOS that does not automatically freeze the drive or SSD; otherwise, the tutorial would come to an end at this point. --user-master u specifies that the user password is referenced in the following. Because this option is the default, you can omit it at this point. You will then see the output in Listing 3. Because malware with root privileges could change the password again in this state (SEC5), an immediate freeze of the HDD/SSD makes sense, and this is what most laptop BIOSes actually do. After that, the SSD is secured against other security-relevant manipulation (state: SEC6). By the way, a counter in the hard disk electronics allows only five attempts to enter the user password. Otherwise, the device remains locked in SEC4 state. Any further attempt at unlocking is only possible after a power cycle or hardware reset. hdparm then returns the output in Listing 4. The myth stubbornly persists that secure overwriting of hard disk sectors is only possible by overwriting at least 137 times with random bytes. What was true in the past no longer applies – this approach is no longer appropriate given high-density modern disks. Moreover, overwriting all the cells multiple times on SSDs is not only pointless, but it also massively shortens the service life. For reasonably modern disks and SSDs, a single overwrite with null bytes is sufficient. To do this, the ATA standard supports the SECURITY_ERASE_UNIT command. This command tells the hard disk controller to irretrievably delete all the data on the device. The command has a normal mode and an enhanced mode. Normal mode does the same thing that dd does, but it takes the load off the CPU and PCIe bus by overwriting all addressable LBA sectors, mostly with null bytes. If DCO (Device Configuration Overlay) is running, that is, if the disk shows fewer sectors and therefore a smaller capacity than the maximum possible, and if it spoofs a different geometry to the operating system and the BIOS (a relic from the hard disk and BIOS Stone Age), then only this small area is cleared, because only this area is LBA addressable. Enhanced Mode ignores DCO (but does not reset it) and overwrites all sectors, including all deallocated areas from the G-list with manufacturer-specific data. The G-list is a list of all sectors marked as defective and deallocated in the past whose LBA addresses have been reallocated to reserved areas. The operating system cannot directly access these areas. Only the disk controller itself has access to them; it does not reveal their contents, but it does delete them reliably. To run the SECURITY_ERASE_UNIT successfully, the device status must be SEC5; the security line in the hdparm output must read enabled and the device must be not frozen. In both cases, not only is the delete process described above carried out, the user password is also cleared (reset to NULL) and Security mode is disabled. The device is then in the unprotected SEC1 state. Thus, the SECURITY_ERASE_UNIT ATA command is used to restore a hard drive to a pristine state. SSD manufacturers try to impress customers with performance data. If you want to know more, why not try your own performance measurements with a standardized test suite that the free TKperf tool implements.